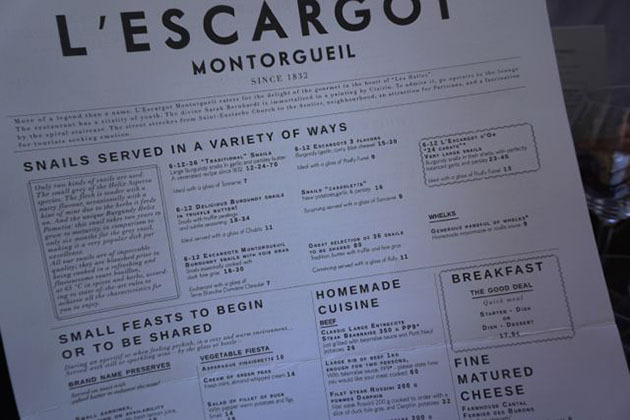 A block away from our little condo in Paris is L’ Escargot Montorgueil on Rue Montorgueil. Yes, a restaurant specializing in escargot. How could I resist? There was no one in the restaurant except for the waite staff eating their dinner. We walked in anyway, drunk with the thoughts of our first meal in Paris. The waiter began to recommend a plate of many escargot flavours but we had ideas of our own. 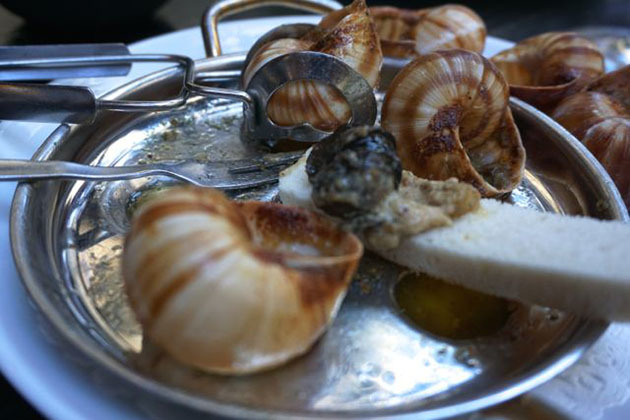 We ordered six Burgundian Escargot in Truffle Butter and six escargot with Foie Gras and two glasses of Loire Sancerre. They sat the truffle butter escargot in front of me and the foie gras escargot in front of Jon. We grabbed our escargot clamps and grabbed for the first one. 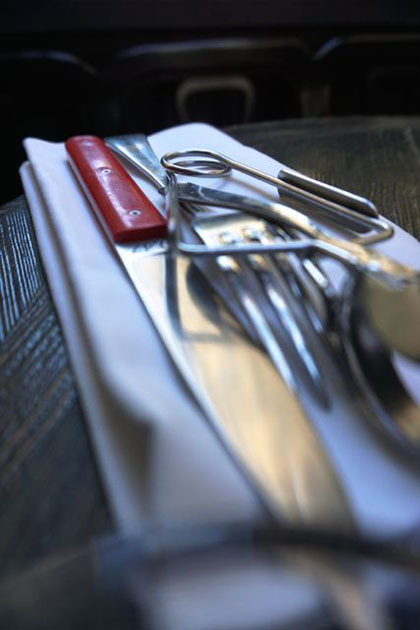 The trick with an escargot clamp is, once you have an escargot shell in its grasp – don’t squeeze. It’s a natural reflex when you’re trying to execrate the slithery slug from its home to want to squeeze the clamp, but that does nothing but loosen the grip and it snaps out – kind of like the Julia Roberts scene in Pretty Woman. You don’t want to do it. 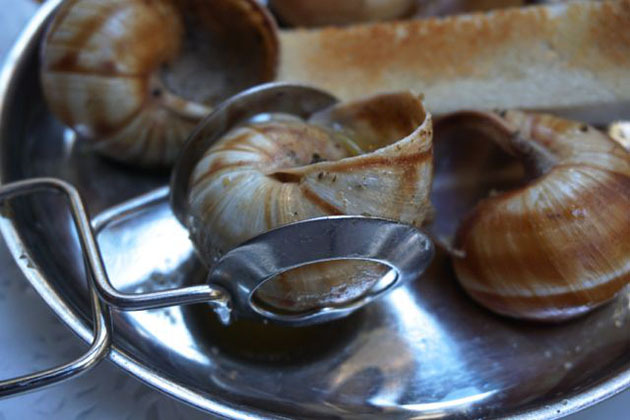 We pulled the little, slivery sucker out onto a warm toast points and turned the shell over to drizzle the remaining juices onto the escargot. Before this goes into your mouth, you take a sip of wine, then a mouthful of escargot drenched in truffle butter or warm slithery pate de foie gras. Before you know it, you’ve sunk deep into the red upholstered benches, your mind sinks with you and the sensations caressing your palate take over. It’s soft, loving, light and so in tune with the dance of your natural body needs. The warm, rich, seductive nature of chewing luscious density begin to fill your entire body and begins to take over your mind with thoughts of love, lust and delirious rapture. When was the last time a Canadian meal turned you totally submissive with thoughts of making love? Happy Mother’s Day to all mothers out there. I wish you’re Mother’s Day is as amazing as mine.